After Jimmy Butler's cathartic emotional release at ​Timberwolves practice, where he beat star players ​Andrew Wiggins and Karl-Anthony Towns with backups, the Minnesota guard has become an even more polarizing player. Few have forgotten about his ​public trade request either. 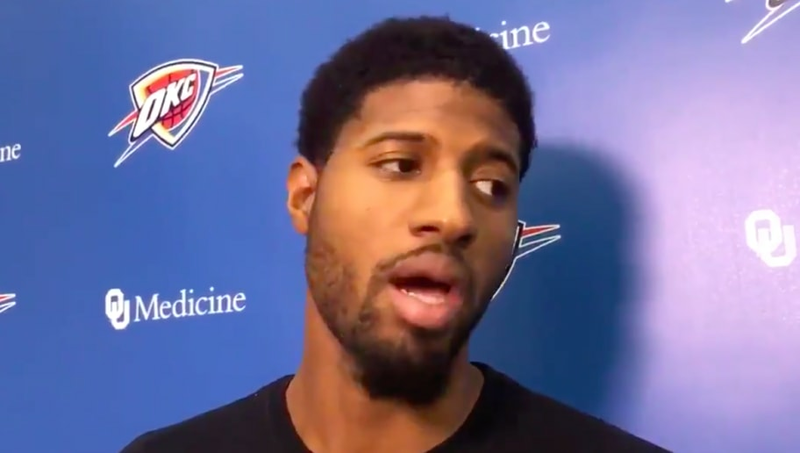 But, Butler has at least one other NBA star documented in his corner in Thunder forward Paul George. ​​"Jimmy's a guy whose whole career was made of of work," George said. "[Towns and Wiggins] have that 'it' that a lot of guys don't have. Now they just need to match it with what Jimmy is bringing to the table." Butler's desire to leave Minnesota for either the Knicks, Nets, or Clippers seems more inevitable following not only the volcanic practice session, but also an interview with ESPN's Rachel Nichols that crystallized his feelings toward Towns and Wiggins. The divorce between Butler and the Tom Thibodeau-run Timberwolves seems like it's more and more likely by the day. Whether Butler's antics make you view him as an obsessively driven workaholic in the Kobe Bryant mold, or a pain to play with who is being excessively emotional, Butler at least has the support of one vocal NBA star and likely dozens more.